Tetraedr T38 “Stiletto” / SA-8 Gecko (© 2011 Michael Jerdev). 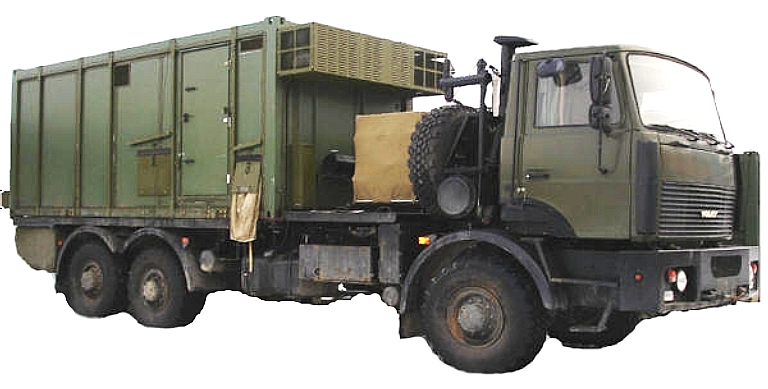 The Tetraedr company in Belarus have conducted a long running and commercially successful upgrade program on legacy fleets of the Soviet built 9K33 Osa/Romb / SA-8 Gecko Surface to Air Missile system, which was developed during the Cold War for PVO-SV (Soviet Army Air Defence) and other Warpac Armies to provide a short range terminal point defence capability for armoured and combined arms divisions on the move. The SA-8 Gecko has been widely exported and remains a popular weapon in developing nations, as it is highly mobile, capable of operating with substantial autonomy, and is well suited to setting up ambushes against fixed and rotary wing aircraft. 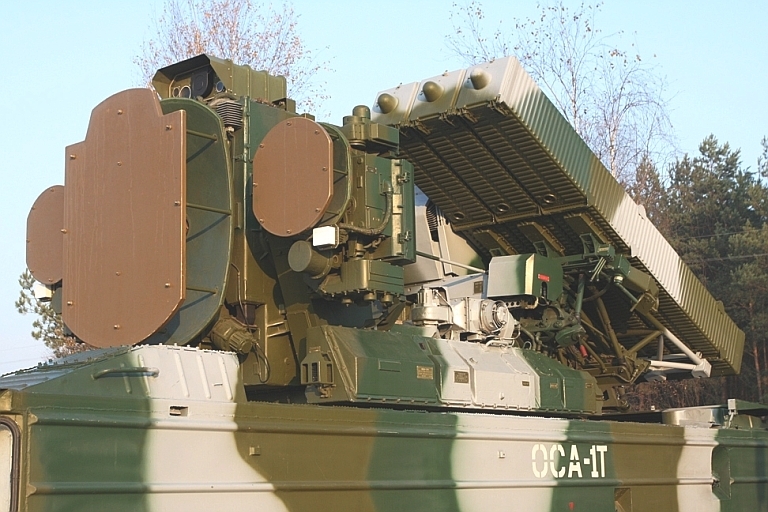 The Tetraedr Osa-1T program involves a substantial rebuild of the legacy 9K33 weapon system, with digital hardware replacing much of the legacy Land Roll radar system and supporting computer system for the automatic CLOS missile guidance system. 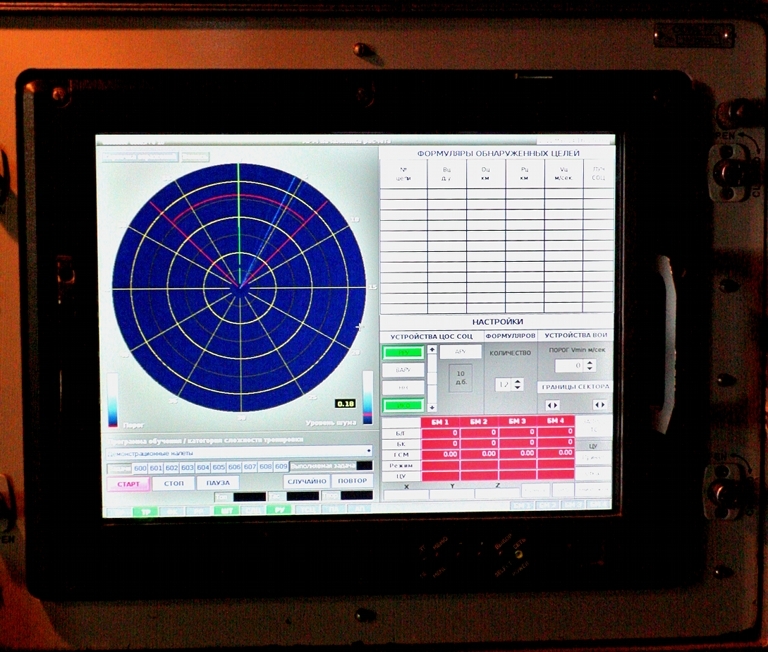 The upgrade includes new operator consoles and displays, and a new electro-optical tracking subsystem. 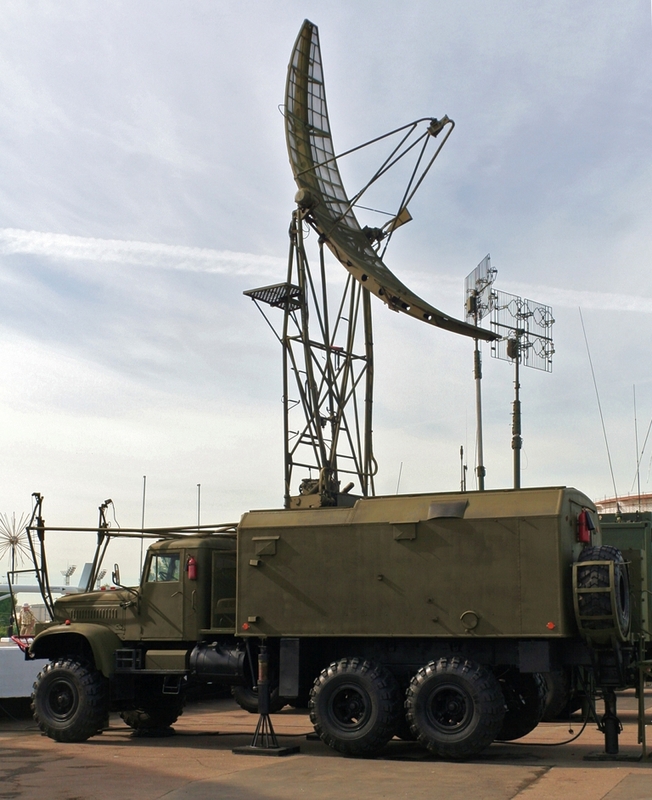 Osa 1T updated Land Roll radar stations in MZKT-69222 (image © Miroslav Gyűrösi). Recently the Osa-1T upgrade package was extended to include the new MZKT-69222 6 x 6 hardened chassis, replacing the amphibious legacy BAZ-5937 chassis of Soviet origin. While the MZKT-69222 was previously an upgrade option, the steadily declining condition of legacy BAZ-5937 chassis has resulted in Tetraedr now performing chassis rehosting on all 9K33 systems to be upgraded to Osa 1T standard. 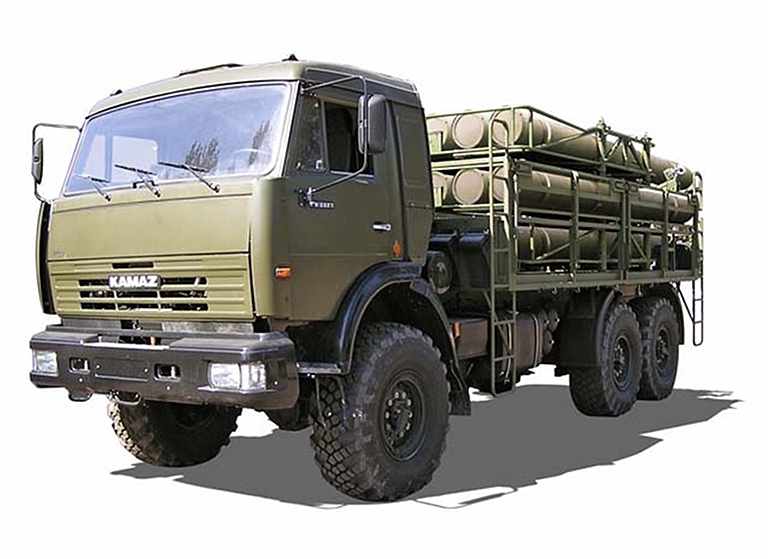 The newer MZKT-69222 provides better off road performance, higher road speed, better resistance to air delivered munitions, and is more reliable and maintainable. A major concern identified by Tetraedr has been the declining and ageing warstock of Soviet built 9M33/9M33M1/2/3 missile rounds. 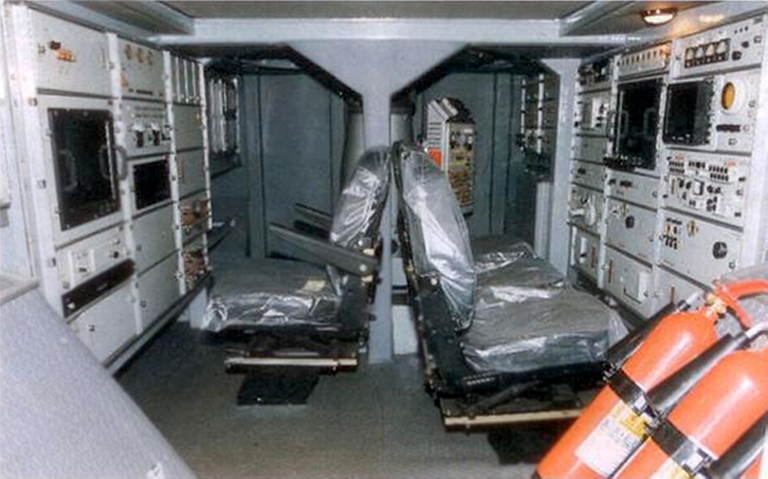 While these can be relifed by propellant, warhead, pyrotechnic and wiring replacement, training usage over time inevitably depletes numbers, given that the missile went out of production during the Cold War, replaced in Soviet PVO-SV units by the newer and more effective 9K331 Tor / SA-15 Gauntlet SAM and 2K22 Tunguska / SA-19 SPAAGM. 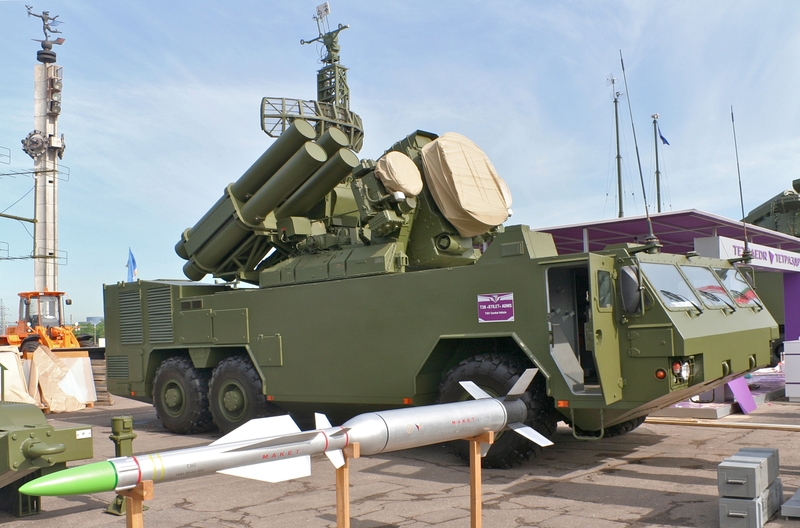 Another consideration was that the legacy 9M33/33M series missiles were limited in range and speed, and thus not entirely effective against the much broader spectrum of contemporary battlefield threats, especially PGMs and pop-up threats such as anti-tank helicopters. 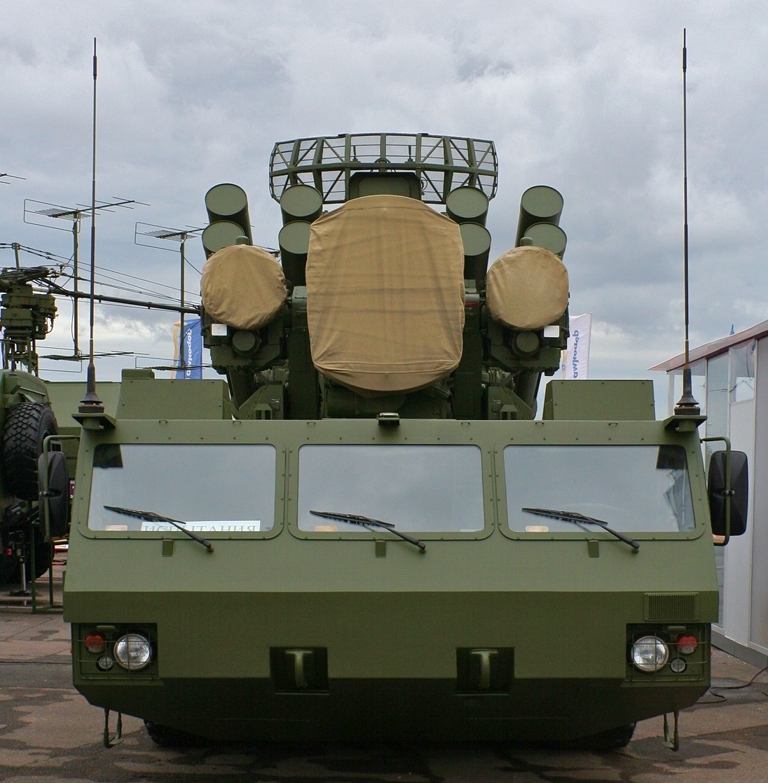 This placed Tetraedr at a disadvantage when competing against Russia's Almaz-Antey, offering the Tor M2E / SA-15D, and KBP, offering the 96K6 Pantsir S1 / SA-22 series. 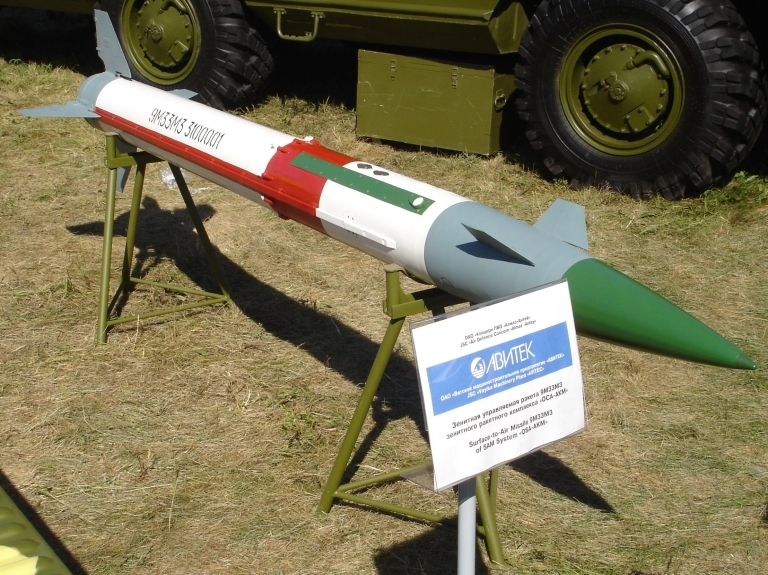 As result, Tetraedr formed a partnership with Luch in the Ukraine to develop a new missile, the T382 Stilet (Stiletto). The T38 weapon system thus comprises a heavily rebuilt Land Roll radar package, new electro-optical and weapon system, new MZKT-69222 chassis, and replaces the six elevating box launcher mounted 9M33M series missiles with eight elevating launch tubes, each containing a single T382 two stage missile round. From a strictly technical perspective, there is so little left of the original 9M33 / SA-8 Gecko system that the T38 Stilet is effectively a new SAM system design, which employs some components of the legacy Land Roll radar system. Whether NATO assign it a unique SA-2X series designation and name remains to be seen. At best it could be described as a “derivative” of the legacy 9K33 / SA-8 Gecko system. 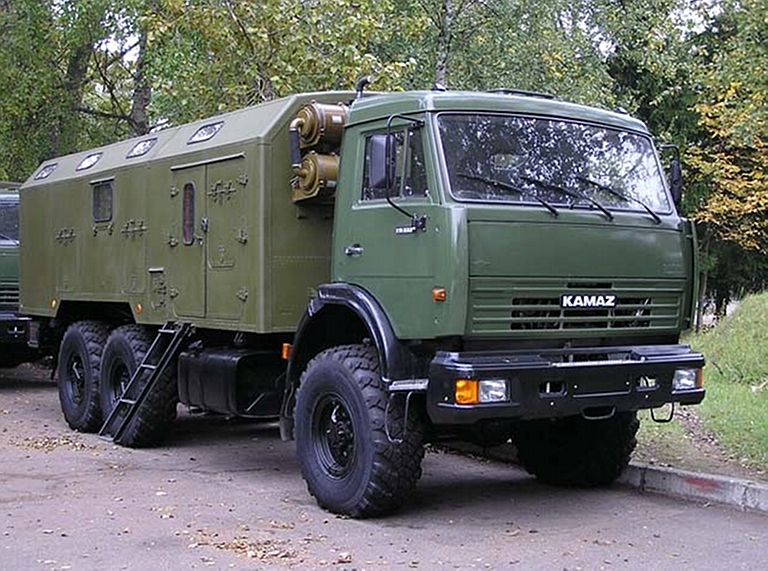 Battery composition is four T38 TELARs with one acting as a “lead TELAR”, and train of support vehicles comprising KAMAZ 5350 6x6 truck hosted T383 Transporter/Transloader Vehicles, and three engineering vehicles, detailed below. Tetraedr have not to date elaborated on integration with other IADS components, whether the T38 battery is used to support a manoeuvre formation, or used to defend fixed targets such as infrastructure against cruise missiles or other PGMs - the upgraded radar and higher performance missile round would be viable for the latter role, unlike the legacy Land Roll, and 9M33 series missile round, both optimised for battlefield threats. 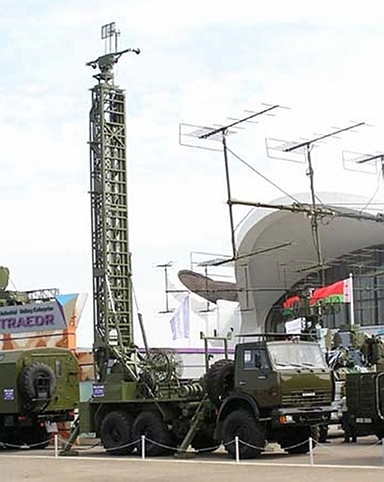 It is most likely that Tetraedr will offer standard interfaces to legacy Soviet command posts and radars, and more recent replacements of Belarus origin, the latter permitting more comprehensive Belarus sourced upgrade packages. With twice the engagement range of the legacy SA-8 Gecko, better mobility, better ECCM capability, robust E/O engagement capability, and a faster missile round, the T38 Stilet system will be much more lethal and survivable than the legacy Gecko systems it replaces. 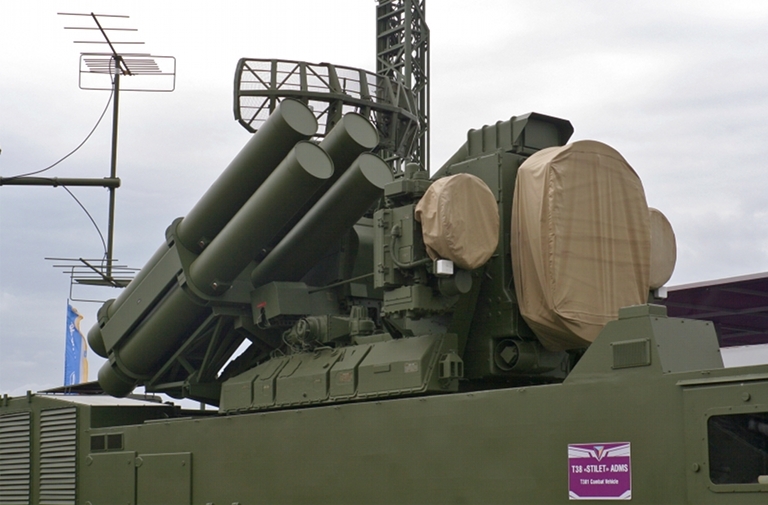 While it has potential to perform in the counter-PGM role, it is limited in its ability to track and engage multiple targets concurrently, in comparison with the Russian built phased array equipped SA-15 and SA-22 systems. Tetraedr T38 “Stiletto” turret detail. The SA-8 Land Roll radar antennas are retained. Note the dorsal electro-optical system (© 2011 Michael Jerdev). The Tetraedr Osa-1T upgrade replaces much of the legacy radar internal hardware, but retains the original turret and microwave antenna suite. 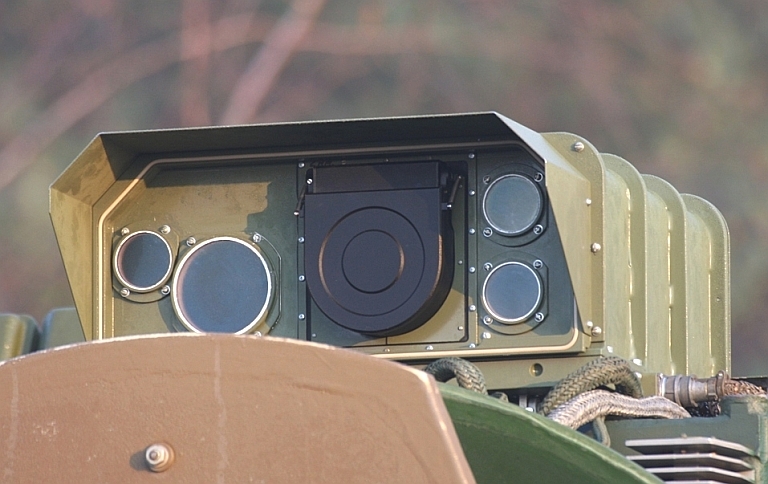 The legacy X-band Land Roll engagement radar package in the SA-8 Gecko was designed to provide a completely autonomous acquisition and engagement capability. The acquisition component is equipped with a mechanically steered stabilised paraboloid section antenna, providing a 1° - 4° mainlobe in azimuth and switchable 3° to 19° mainlobes in elevation, sweeping at 33 RPM. This radar produces a peak power of 250 kiloWatts. Tetraedr's upgrade permits tracking of up to 48 airborne targets, and sees heavily improved ECCM capabilities, which have not been detailed well. The 200 kiloWatt peak power rated Land Roll tracking and missile guidance component is mounted on the front of the turret. It has a large protected truncated paraboloid primary reflector with a ~1° mainlobe, which can elevate to +78° and depress to -12°. 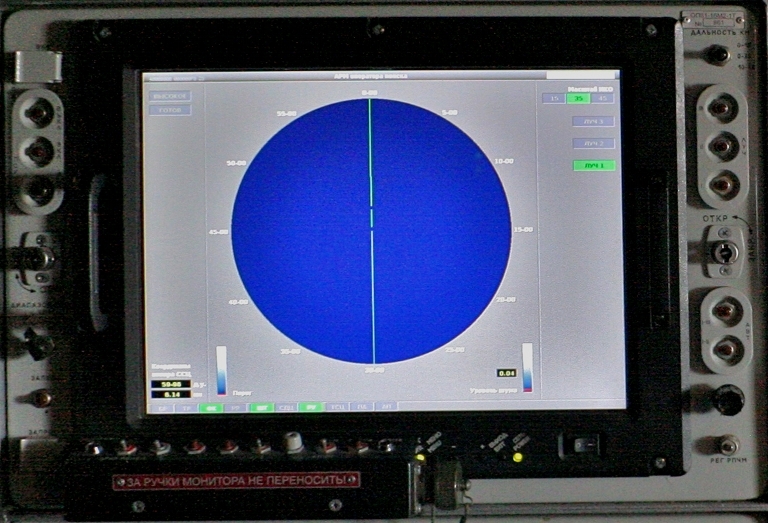 This radar is used to perform precision tracking of targets. 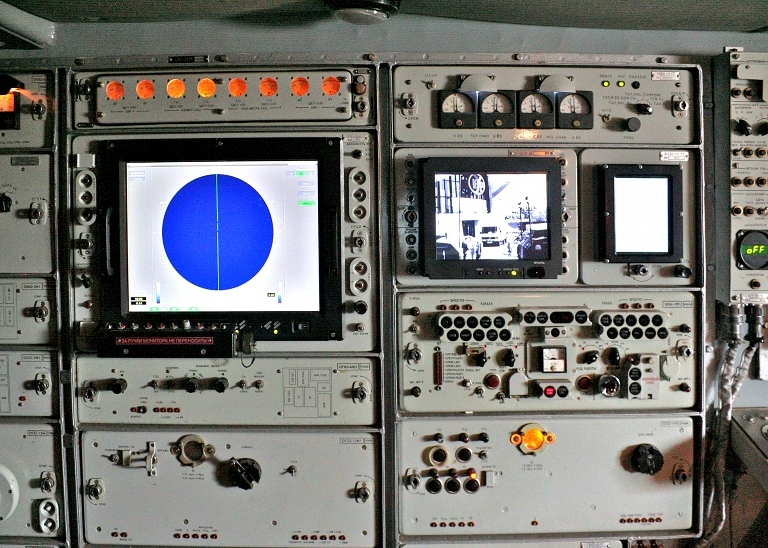 To either side of the primary antenna are a pair of missile capture and uplink antennas, used to support the Command to Line of Sight (CLOS) guidance on the missiles. Russian sources claim the trajectory used included a vertical bias component to fly the missile above the line of sight converging with the target at impact. The cited performance for Tetraedr's upgrade includes the ability to track 0.03 m2 LO targets, such as PGMs, cruise missiles or aircraft, and the ability to track a medium to high altitude legacy fighter RCS target at 40 km, and an similar target at 50 m AGL at 27 km. The adjunct E/O tracking subsystem, mounted above the primary tracking aperture, combines stabilised 9°x12° WFOV TV band sensor, and a 4°x6° NFOV targeting/tracking TV band sensor, which can acquire a MiG-29 at 20 - 30 km range under day VFR conditions. The TV channel is boresighted with a midwave band thermal imager, providing a 9.1°x6.9° WFOV mode and 2.3°x1.9° NFOV mode, for acquisition and tracking respectively. An Nd:YAG laser rangefinder is also boresighted, to permit optical only engagements out to 18 km range, propagation conditions permitting. There are two missile command uplink channels emitting at 140 kW peak, with two of eight selectable frequency channels for missile control. The missile beacon tracker can track two missiles concurrently. The missile beacon tracker is effective to 24 km range, in an arc of ±15 ° in azimuth and ±12° to 78° in elevation. Two guidance modes, designated KDU and MMT are employed, details of which remain to be disclosed. 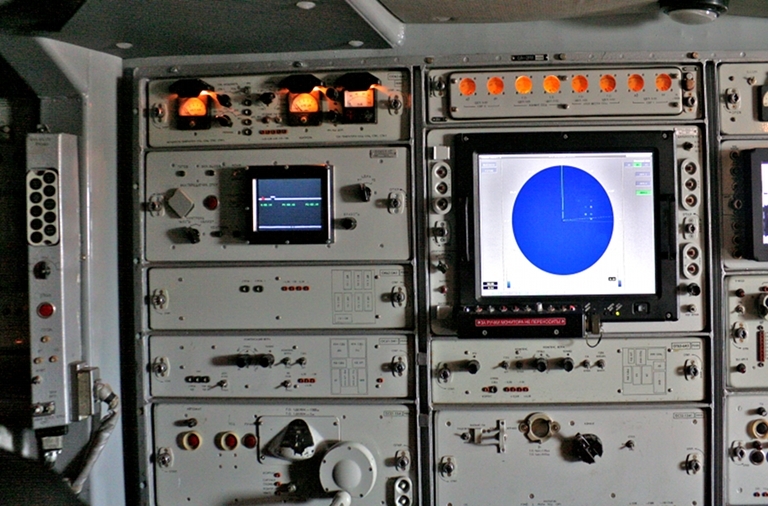 Above, below: T38 Stilet crew station consoles (© 2011 Michael Jerdev). Above, below: T38 Stilet crew station PPI LCD display (© 2011 Michael Jerdev). T38 Stilet panel (© 2011 Michael Jerdev). Luch T382 Stilet missile round mockup at Milex 2010 (© 2011 Michael Jerdev). 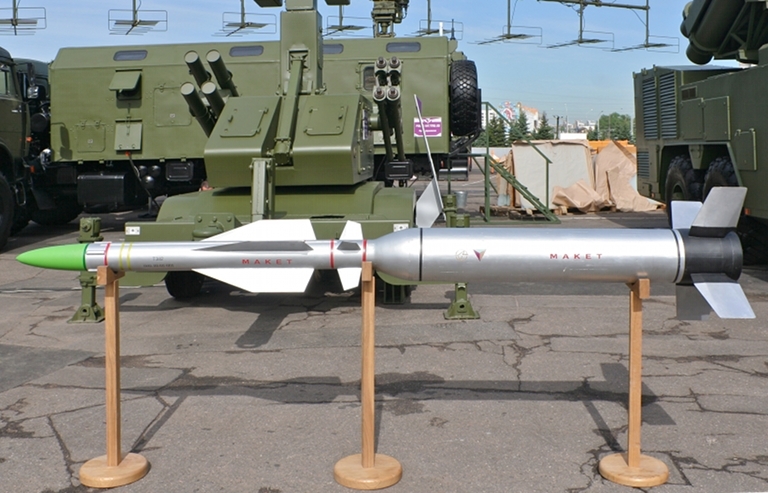 Luch T382 Stilet missile round (Tetraedr). 96K6 Pantsir S1 57E6 missile round (KBP). Legacy 9K33M3 / SA-8C Gecko Fakel 9K33M3 Gecko missile round. The green painted dielectric covers the proximity fuse antennas (Wikipedia image). While the T382 Stilet missile round resembles to some extent the Russian 57E6 Pantsir S1 missile round, it is a unique and entirely new design. The two stage missile, like the 57E6 is intended to very high acceleration rapid reaction engagements against pop-up targets. Prelaunch the 116 kg round is 3.158 metres (10.4 ft) long, with a booster diameter of 0.2096 m (8.25 inch) and fuselage diameter of 0.108 m (4.25 inch). The launch tube with missile round loaded weights 151 kg () and is 3.253 m (10.7 ft) long. The fuselage carries an 18 kg expanding rod / fragmentation warhead. Boost stage burn duration is 1.5 sec, followed by the fuselage sustainer burn of 20 seconds. Cited missile performance is vav = 850 m/s with a maximum missile load factor of 25 G, limiting effectiveness against crossing targets. The T382 round is at the time of writing in development with a prototype expected in 2012. Current SA-8 Gecko operators cited include Algeria, Armenia, Azerbaijan, Belarus, Bulgaria, Cuba, Ecuador, Georgia, Greece (former DDR inventory), India, Jordan, Libya, Poland, Romania, Russia, Syria, Turkmenistan, and the Ukraine, all of whom are potential export targets for the T38 Stilet system. To date no sales have been disclosed. 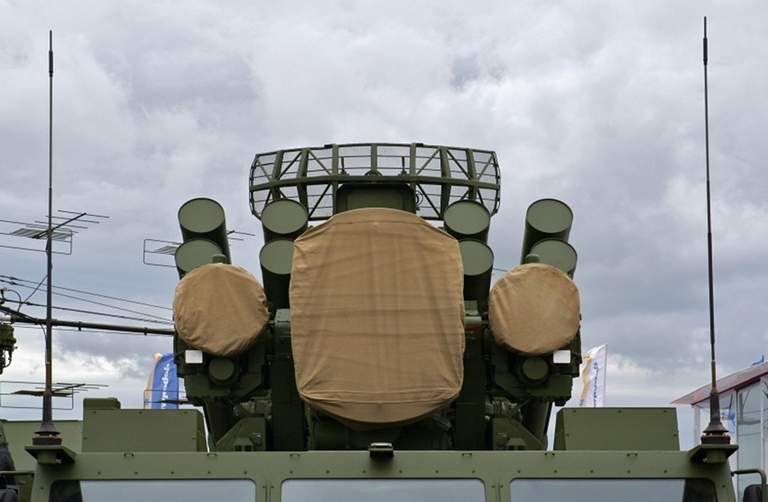 1 Radars and command posts have not been disclosed to date and will likely reflect existing customer systems; the listed types reflect Belarus built or supported systems likely to be offered in a comprehensive upgrade package. The Tetraedr T38 “Stiletto” / SA-8 Gecko has 8 launch tubes, two more than late model SA-8B TELARs (© 2011 Michael Jerdev). The T383 Transporter/Transloader carries up to 24 reload rounds, which can be transferred to the TELAR in 5 to 8 minutes (Tetraedr). 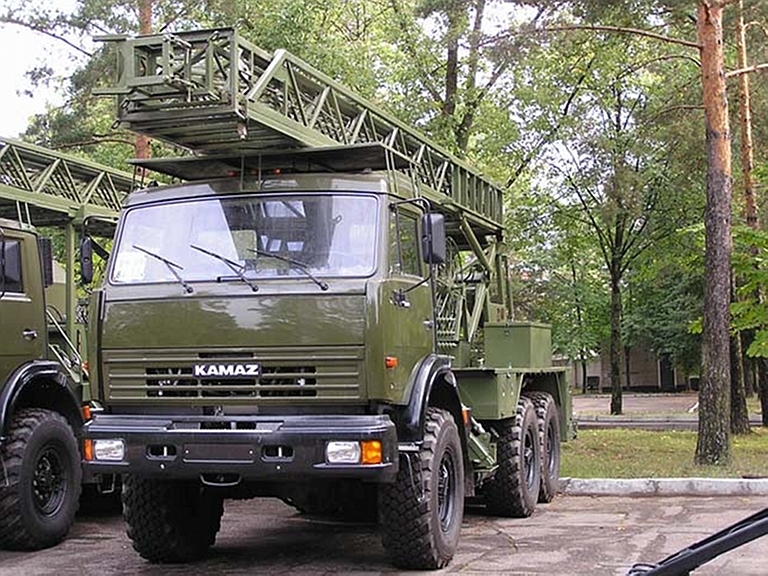 KAMAZ-5350KMU 6x6 flatbed truck with 750 kg hydraulic hoist (KAMAZ). 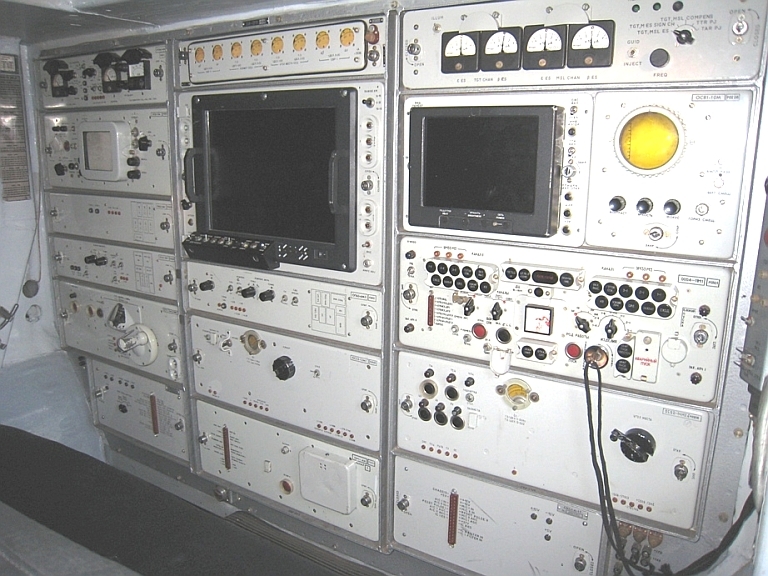 The 9V914-1T Mobile Alignment Station is a design based on the original 9V914 system, built during the Cold War for in theatre calibration of the Land Roll radar system. 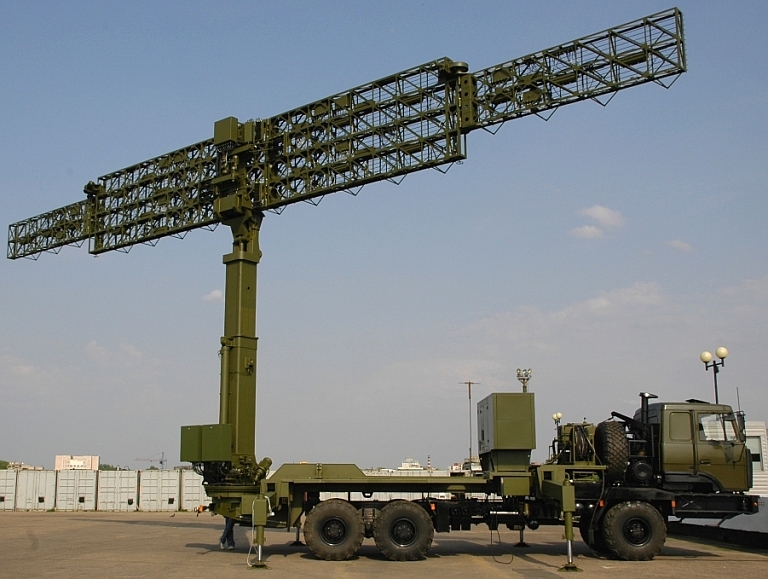 The system employs a hydraulically elevated telescoping lattice frame structure mast (Tetraedr). 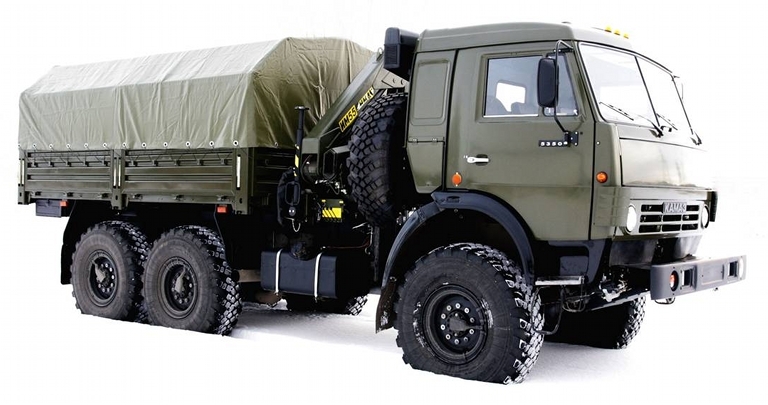 The Belarus built Ranzhir E/M command post is supplied on the tracked MTLBu chassis, but is also available in a 6x6 truck variant, intended for applications where high road mobility is important. 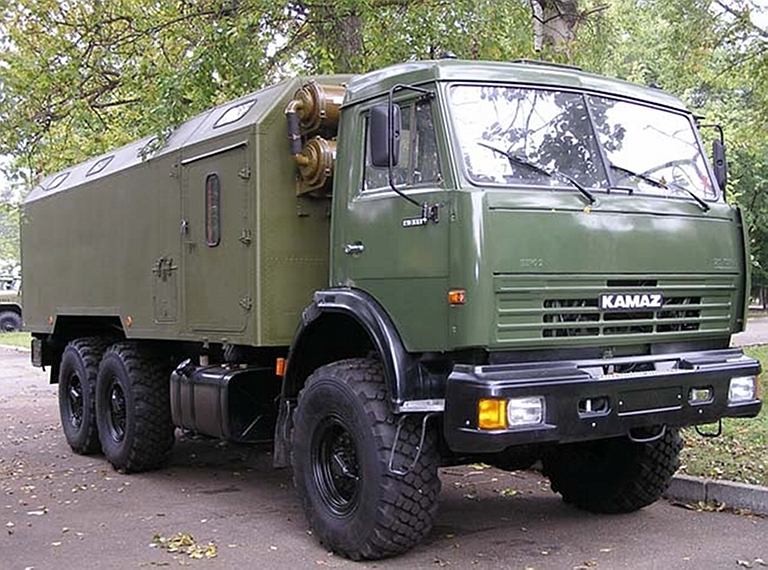 Legacy 9K33M batteries used a single PU-12M command post, which controls four 9A33M TELARs in a battery (Rosoboronexport). 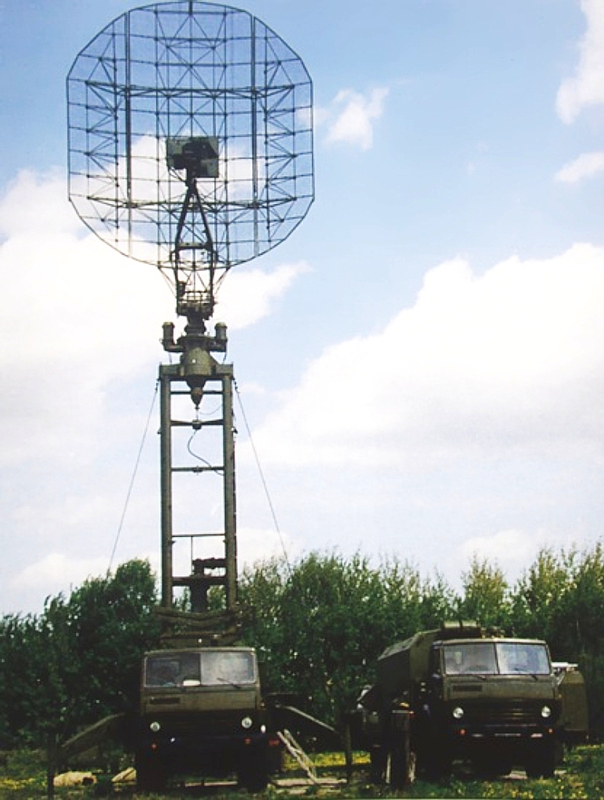 The Belarus designed KB Radar (Agat) Vostok D/E is an entirely new 2D VHF radar design, using a unique wideband "Kharchenko" square ring radiating element design, in a diamond lattice pattern (image KB Radar). The Kasta 2E1 and 2E2 are the latest incarnations of the well established Flat Face and Squat Eye family of semimobile UHF band tactical acquisition radars. The initial P-15 Flat Face A introduced the now characteristic double stacked array of elliptical paraboloid section antennas. 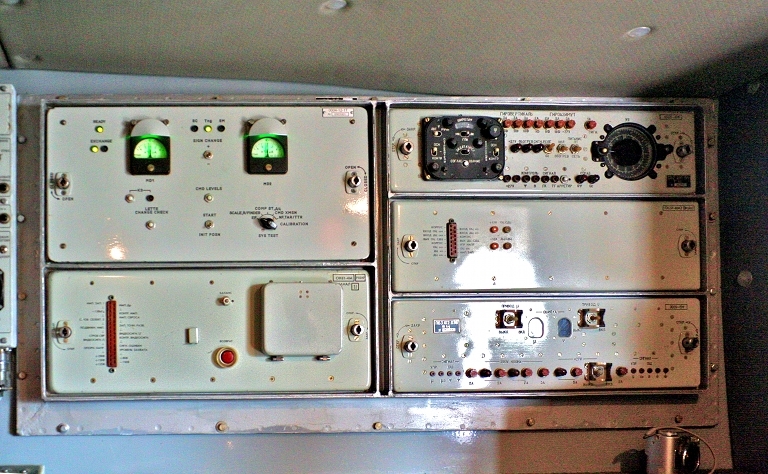 This radar was widely exported by the Soviets to Warsaw Pact nations and Soviet Third World allies and clients (Rosoboronexport). Upgraded PRV-16BM.01 self-propelled 6 GHz band nodding heightfinder at Milex 2011 (© 2011 Michael Jerdev). Miroslav Gyűrösi, Tetraedr teams to offer T38 Stilet derivative of SA-8 'Gecko', Janes Missiles and Rockets, June, 2010.